Hehe I bloody love today’s quote! 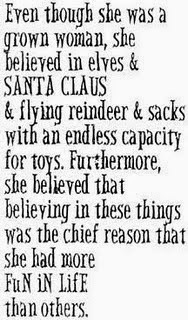 Why should we stop believing in Santa and flying reindeers?! It’s all part of the Christmas magic I love, and at 28 I’m not ready to be a boring ‘grown up’ just yet! So therefore I challenge you all to embrace the fun and magical aspect of Christmas this week!